Synopsis: When eight strangers become trapped in a lodge during a ferocious blizzard in Wyoming, USA, a mystery begins to unfold as to whether some people are who they say they are. Review: When you walk into a film written and directed by the one and only Mr Quentin Tarantino, chances are you know what to expect. After all he is a man who has made his name in Hollywood for his extremely well written characters, excellent dialogue, and some VERY bloody violence. All are on show and then some with his eight feature film, which is his second Western after the glorious Django Unchained, which happens to be his highest grossing film of all time. 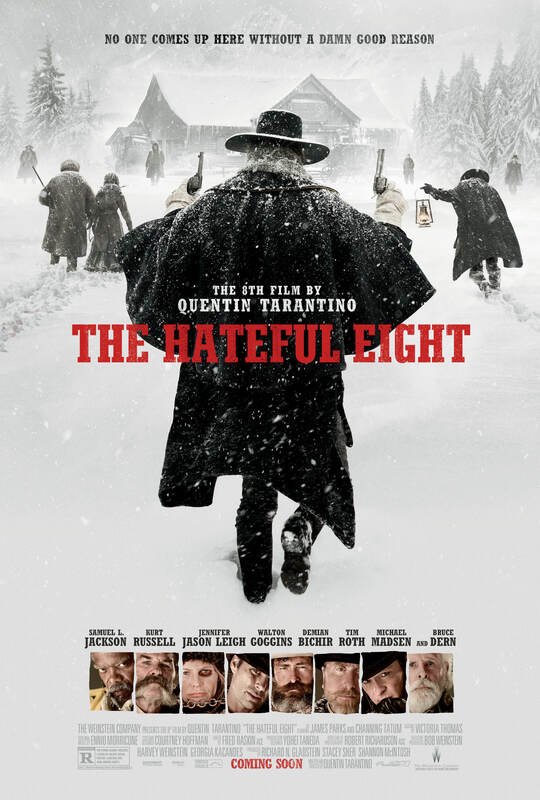 While Django was set pre Civil War, Mr Tarantino takes us post Civil War in this film, with the focus being on a group of individuals (eight in total funnily enough) who get acquainted with one another while they are trapped in a small building during the blizzard that has set them back on their way. Yet immediately something is off, the suspicion and mistrust begins to grow amongst the characters, as some have doubts as to whether they are who they are claiming to be. There’s a mystery that needs to be solved and it isn’t long before things start to get a little bit messy. Tarantino is one of the finest directors working today, his movies are synonymous with terrific writing, sharp dialogue and very strong characters. All of the ensemble cast truly shine in their roles with each and every one of them giving truly excellent performances. However, there are a couple of performances that truly deserve special praise and could well be in with a shot of picking up some awards. Principally, Tarantino regular Mr Samuel L Jackson and Jennifer Jason Leigh give arguably the best performances of this incredibly talented cast, but that should take nothing away from all of the other performances, because they are all superb. It is at times a very dialogue driven film, but this is not a problem, because the dialogue is so riveting and so well written, that the audience is captivated the entire time, watching these characters interact and develop distrust and suspicion. As is the case with nearly all of Tarantino’s films, the great acting is matched with great writing, and the Hateful Eight is no exception. In this over three hour story, the first hour or so is all build up, getting to know the characters, meeting them one by one. The tension here remains at a minimal level, but there is not exactly a warm feeling between anybody. The early build up is a little slow, until we get to Minnie’s Haberdashery, and that’s when any warm feelings are immediately turned as cold as the weather outside, and the tension and suspicion gets stronger with each passing minute of screen time. Tarantino does enjoy some good monologues and there’s a few to be witnessed here. It wouldn’t be a Tarantino movie if there was no violence and when the axe finally drops and it begins, boy does it provide some glorious and bloody entertainment for the audience and then some! The cinematography on show, provided by another frequent Tarantino collaborator Robert Richardson is gorgeous, capturing the setting of a chilling winter in the USA perfectly. The audience feels the freezing temperatures the characters find themselves in. The score composed by Ennio Morricone is also equally superb. Like with The Revenant, this cannot have been an easy shoot for the cast and for the crew, but for all the troubles of everyone involved, it was all worth it to deliver another extremely good film from Tarantino that is sure to receive a bunch of Academy Award nominations in this upcoming awards season, and they would be very well deserved ones at that. A little slow in the early stages, but it pays off big time in the end, with superb writing, tremendous acting, terrific directing, and a top score. Another superb edition into the near perfect filmography of Quentin Tarantino. Riveting review, I’m hoping to catch this movie in cinemas. Thanks Vinnieh! Please do, it’s definitely worth your money! I’ll have to check my schedule, but I’d love to see it in the full cinematic experience. Nice review. I thought this was a little slow, and not necessarily well-written from a character aspect, but well-written from a story aspect and just a complete viewing experience. I need to probably watch multiple times to truly get a feel for how I feel about it. This has to be one of the worst movies I have ever seen. I’m glad my seat was comfortable, ball up and sleep through, since my hubby wanted to watch. I wouldn’t have stayed if he had not been with me, too much blood and gore-projectile vomiting. Blood and violence is a staple of Tarantino, if you’re not comfortable with that, you should not see Tarantino movies as they’re not for everyone.